I was in 8th grade in 1992 and I was having my final exams during most of the tournament so I wasn’t allowed to watch most of the matches! However I was free from exams by the time final came. We used to live in a small town and I remember everybody being so excited about the match. Pakistan` s dramatic turnaround in the tournament and coming from behind to win the semifinal performance had really heightened people` s expectations. It` d be difficult perhaps to single out one special moment of that day. From the early scare when Aamir Sohail & Rameez Raja got out cheaply, Imran & Miandad` s rescue act, Waseem & Inzamam` s partnership in the end that ensured a respectable score for Pakistan, Botham`s early departure in England innings that sparked celebrations, Aaqib Javed` s fabulous catch that dismissed Graham Gooch, Waseem Akram` s two wicket burst and finally Ramiz Raja` s catch off Imran Khan that sent the whole nation celebrating it was all very special. Another special memory from that day that I still hold is the world cup song. I loved the 92 world cup song and I wasn’t able to fully listen to it during most of the tournament. However after the match was finished PTV played the song again and again and again and I felt so proud! – I cannot express that feeling in words. I still get Goosebumps whenever I listen to that song. 1992 world cup as a whole was very special as well. The format of the world cup (in which every team had to play the other teams at least once) was highly appreciated as it gave everyone a fair chance. We were introduced to South African cricket team for the very first time [does anyone remember Richard Snell?? I loved his hair style ] and for the first time we saw international matches with colored clothing and under lights. I was in 9th grade in 1992 and rememebr being glued to our 24′ Sony TV which was considered big in those days. I rememebr jumping up and down while hugging my mumu and mumani that I was watching th4 match with when Wasim took those two amzing wickets. Everytime we talk about bowling I talk of those two amzing deliveries that wasmin bowled. Under such pressure to come in and win the final for the team and his country all credit goes to him. 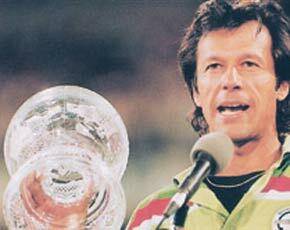 But again it was the leadership of Imran and the steady hand of Javed that really won us the cup. We relaly need a good captian again. Someone like Imran to inspire and have them fight like ‘cornered tigers’ cause God knows we are more cornered than ever before. We will get past this phase InshAllah! I was in my final year at kings college, and we (family) were up at 3 in the morning. I suppose Akram’s 2 successive wickets of Lamb and Lewis clinched the title for Pakistan, after a rather poor start to the tournament. The Pakistani national cricket team of today is no where near as talented or organised as the Pakistanis of the late 80s early 90s. I was sitting for my metric exams that year and I do remember how at the begining of the paper the day Pakistan played the last league match against Newzeland examinar asked every one to pray for Pakistan’s success and we all did. I was more interested in watching the match between Australia and Westindies and was hoping that Australia losses. The Final it self was intreging, losing two wickets early, slow batting both by Imran and Javed (with a purpose of course) and Wasim Akram and Inzi playing brilliantly at the end. Only reason Pakistan won that tournament was that they played as a TEAM!!! and that is what our current team should learn. I was 22 then studying at Luton University had no TV so had to watch the match at local Rileys snooker club. And when Wasim Akram bowled Alan lamb, I knew Pakistan will win and the commentator said ‘Akram has cleaned up lamb and perhaps so to England. I was the only person supporting Pakistan at the ‘all white’ snooker club the lads did Pakistan a lot of proud that day in Melbourne cricket ground. When I was in class 3 I was fond of football, but when I saw Wasim Akram bowling in 1992 I was inspired by that person. He is capable of changing the game at his will on his own. I stated playing cricket and watching cricket just to Wasim Akram bowling. In class 3 it became my passion. I am working in a bank today but if I was not working today I would be playing cricket at some level. I copied Wasim style of bowling. Now the day he retires cricket is not any more in me but after all this crisis time. I still want to render my services for Pakistan cricket. Like Wasim Bhai said, all you have to do is to believe in yourself that what I have carried with me that I can do it. I was the student of class 6th and my annual examinations were being taken. I took radio in the examination hall for radio commentary of cricket match. I was been punished by teacher for bringing the radio and it was taken by examiner into his custody and he played the radio. examination hall was looking like a stadium more than the its basic purpose. It was a tremendous moment while it announced that Pakistan got victory in the world cup final of 1992 world cup. I can never forget this moment in my life. I was not worried about the result of my examination but was worried for the cricket team. and Thanks God that Pakistan won the examination. There is a saying that if there is unity and passion to win with practical sincere efforts then only anything can be achieved. Leadership is most import factor for driving anything in the world. Perception, passion, hardship bearing, tolerance power and consistent efforts will only leads you to the success and this could be seen in the 1992 final. I still feel it dream that we won the world cup. I was eight years old and watched it at home in Quetta … we didn’t have any electricity for hours so we missed most of the match but I still remember the last catch and the cheers and drum beats. I guess my favorite moment is the last catch because I will always remember it …..
People of Pakistan are waiting for new a Imran Khan, who plays for country but not himself, a perfect captain,a captain who manages the team. I was 23 years old working as a taxi driver in Seattle Wa USA,when a Indian taxi driver came up to me, and said in Punjabi (world cup layy gay hoo) I was so surprised to hear that, because I didn’t have excess to watch that final. Living abroad you make some money, but you miss too many happy moments. God bless Pakistan. No one thought that Pakistan would be the next champion but all the credit goes to whole team and specially wha wha seam, Wasim. Really a great baller and a kind person. Aamir Sohail-A man who consider his opponents nether less than enemies. Ejaaz Ahmad-A man showing way to the team in fielding department. A great team leader have achieved his dream of nation it was golden moments in cricket which has been done by the Pakistani team, and that time of period real teamwork shown by the Pakistani players in the guidance of Imran Khan the great. But now we have lost the team work ownership. But lets see what will be output. I still remember the moment when Akram was in full throttle and every member was trying and giving his best. Every ball was building the tension and when Ramiz took the last catch it looked so easy he seemed in full command. We played as a unit and were victors. I believe we can still do it. Only if we unite under the flag as one team and not as 11 players. first time Pakistan played like team. I have lived in UK from last 46years. It was one of the proudest moment of my life. One was proud to be a Pakistani after we have won the world cup of 1992. Its pity such moments are not repeated as often as one likes it to be. When such luxury is not available I always fall back to the memory of 1992. I still remember the days. I was in B.Com part I at The Punjab College of Commerce Rawalpindi. During the World Cup, it was all about cricket regardless of where we were, in class, at the cafeteria, or at the bus stop waiting for the bus. It was all about Imran and Co. Our Accounting class was always fun as our professor was a big fan of cricket. In his class, for the first 10 min or so, we were allowed to talk about cricket and comment on the chances Pakistan had. During the first two weeks of the Cup, nobody expected Pakistan to even reach the Semi Finals. But things changed as we all know. It was a miracle! The day of the Final, there was no school as I think it was Friday. I remember the match, every bit of it. I think my favourite moment was when Wasim took two wickets in two successive balls. That was the turning point of the game. Way to go Pakistan!!! Certainly a great moment not just for Pakistan but for this sport. The two wicket taking deliveries by Wasim Bhai can never be bowled again by any fast bowler. Off all the cricket matches i have watched till today i’m yet to see any bowler ball something of that sort. Even a batsman of Tendulkar’s class could’nt have blocked it. Wish Pakistan can produce another Wasim type bowler! I was in grade 7 at that time and saw the full match at home (KHI) along with my big brother. My favourite moment was the catch taken by Aaqib Javed off the bowling of Mushtaq to send Gooch back to the pavilion (amazing catch). When Neil Fairbrother got out, it was very much obvious that Pakistan will be the winner. The one who got 2 wickets in 2 balls – Wasim Akram (man of the match) but dont forget the hard work done by the two greats before Inzamam and Wasim came to the crease…yes, I am talking about Imran Khan (c) and Javed Miandad (v.c)….and everyone performed there job perfectly….Mushtaq’s googlies, Moin’s catching etc. This was the great day for the people of Pakistan. I saw this match on TV in Karachi. Wasim and Izzi were the real heros for the worldcup 1992. I was 9 yrs old when Pakistan won the cup. I some how supported Pakistan once India was badly out of the cup and through out the tournament I enjoyed Wasim at his full glory. When Pakistan won the cup I remember celebrating the win just like we would do if India won it. I really felt as if my country won the cup It was really a happy time for us. Even today when Wasim Akram sits in the stands of Kolkata Knight Riders at IPL he gets all the cheering from the crowd. Really is an icon to all. Wish to see Pakistan Doing good in the Coming world cup and T20 as well. It will really be good for the future of Cricket & our sub continent. If the cricketing world has ever seen the dynamism of an individual turning a pack of divided and ambitious individuals into a cohesive, fighting unit, it was indeed the great, good figure of IMRAN KHAN. winning the world cup with some erratic but hugely talented players was the last thing one would have thought of. But IMRAN, the great turned the fantasy into reality. Javed Miandad, another all time great fought and fought tenaciously to contribute to the dream being transformed into a unforgettable reality. The Semi final and final it was he who held on like a rock of Gibraltar to ward off the rampaging threats of defeat. Inzi’s blitzkrieg was incredible, Akram’s two golden deliveries, Wau, was the divine intervention. What a piece of work he was. IMRAN, the great must be applauded for all times to come along with Miandad. I was 36 at the time and watched the final game at home with a couple of my English colleagues. It ended up being a marvelous tournament, especially having started so miserably. Remember that Pakistan had only managed to win one game of the first 5, and that was against Zimbabwe. As it turned out, Pakistan not only had to win all the remaining 5 games, but West Indies had to lose against Australia, for Pakistan to qualify for the semi-final. Pakistan’s success in the tournament was definitely a team-effort. Everyone contributed – with the sole exception of Salim Malik. The player of the tournament was, in my view, Javed Miandad. His presence at the crease gave a lot of heart to the other Pakistani players and to the Pakistani public at large. He was most consistent, without being brashy and his trait of being a fighter, a fairly rare quality amongst Pakistani batsmen, really stood out throughout the tournament. The final too was a team effort, but the man of the match, Wasim Akram, was instrumental in winning the match. Had he not taken those 2 wickets in 2 balls, Pakistan would most probably have lost the match. One shouldn’t also forget the terrific fielding, something they are so pathetic at, of the Pakistanis in the final. Thank Allah, we just had to win the final, no matter what. Let’s hope we win a lot of World Cups in the future, InshaAllah.